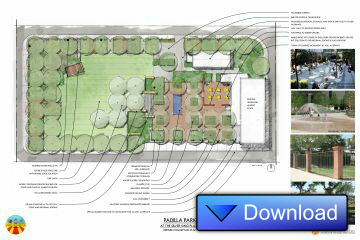 During an October 22, 2013 Town Council Work Session, the Town Council was presented with the concept plan for Padilla Park at the Silver King Marketplace. Padilla Park would include the land immediately adjacent to the rear of the Silver King Marketplace and include the vacant lot west of the Silver King Market Place. Amenities to the park include a water feature (splash pad), shade trees, turf area, decorative perimeter fence, lighting, amphitheater environment with sloped turf, memorial signage, staircase feature, bathrooms, electrical improvements, and a defined dining space. The project would also create one-way streets adjacent to Padilla Park on Ruggles Street and 6th Street with angled parking. The cost of the project is estimated at $300,000. While the Town Council didn’t take action, because the plan was presented in a work session, they were supportive of the project and specifically liked what the proposed Padilla Park would do to attract people to the downtown. In the upcoming months, the Town will prepare the construction plans, collect bids and award a contract to the lowest and most qualified bidder. The construction of Padilla Park is expected to be completed by June, 2014. For questions about Town of Florence activities, contact Jess Knudson, Public Information Officer, at (520) 868-7541.